Imagine living in a world where an extra toe on a newborn will automatically result in the death of the baby, a pig with more hair than normal will be put down, and corn kernels that are not in perfectly formed rows will necessitate burning an entire field. 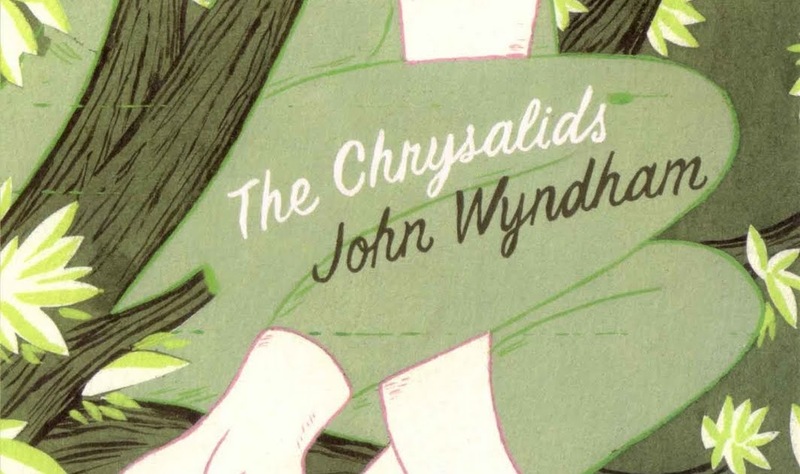 This world exists in John Wyndham’s novel, The Chrysalids. This is the world of David Strorm, the main character in the novel. As a young child, he often dreamed of a city filled with objects considered fantastical in his world, such as flying machines and carts that move without horses. However, as David grows older, he realizes that he has the ability to communicate telepathically with certain other children. This ability means that David would be considered to be a Blasphemy in his community. David does not understand the severity of such status until he meets Sophie, a girl who was born with an extra toe on each foot. David befriends Sophie and keeps her secret. When her secret is discovered by another boy in the district, Sophie and her family are forced to flee. As a result David realizes that, if his secret is discovered, he will suffer dire consequences. As David gets older, he and the other telepathic children master the use of their abilities. David’s forward-thinking uncle, Axel, becomes aware of David’s telepathic power; he makes several efforts to convince David that the extra ability is something worth having, but must be concealed. The others agree to keep their secret, and they are able to live normally for some years. The secret is threatened when one of the others, Anne, chooses to marry a normal (non-telepath) man; although Anne attempts to renounce her powers, her husband eventually discovers the truth, putting the lives and David and his fellows in danger. Another risk emerges when it becomes evident that David’s little sister, Petra, possesses far greater powers of telepathy. Petra’s thought projection is painfully strong and usually involuntary; she is young, and her powers are tied directly to her emotions. When she gets upset, she becomes a compulsive beacon, drawing the others to her. This creates a potentially dangerous situation. Members of the community become aware of David’s powers, and he must flee with Petra and his girlfriend, Rosalind, who has also been revealed as telepathic. They must make a dangerous journey in search of a region where no one knows who they are, or why they left their home. On their journey, Petra begins communicating with a woman in a faraway land, who promises to send help. She also promises to bring them to Sealand, a land which is populated by telepathic people. David and the girls must avoid the posse from their district that continues to pursue them, and are captured the Fringe people, a group of exiled Blasphemies who seek revenge. Themes examined in The Chrysalids include the inevitability of change, man’s inhumanity to his fellow man, ignorance, and bigotry. Despite being over 50 years old, the ideas expressed in this science-fiction novel are still timely today. This novel is an excellent reader for individuals who are avid readers of classic science-fiction. David's home town, also the name of his father's farm. It is a small agricultural community, part of the larger theocracy of Labrador. The neighbouring town is Kentak. On a present-day map, Waknuk can be identified with Wabush in south-western Labrador, adjacent to Labrador City. A Christian fundamentalist civilisation which arose in North America centuries after a nuclear holocaust (dimly remembered as "Tribulation," and attributed to the wrath of God). In the time of the novel, Labrador society is at a technological level roughly comparable 18th-Century America - possessing sailing ships and firearms, but no heavy industry. The capital of Labrador, on the coast down river from Waknuk, is Rigo (Rigolet, in the real world). The island of Newf (Newfoundland) is also civilised, but knowledge of the rest of the world is vague and colored by religious dogma. The inhabitants of Labrador and Newf appear to be normal humans who have retained the pre-Tribulation phenotype; they believe it is their sacred mission to preserve this form, and all other species decreed by God, against the rampant mutations which have continued since the fall of Tribulation. Frontier lands, lying south and south-west of Waknuk, where the chance of breeding true is still less than 50%. Some Offences among crops and animals have to be tolerated here. The enigmatic land beyond Wild Country. Apparently suffered heavier radioactive contamination than the rest of Labrador, being closer to the original nuclear bombings. It is essentially a lawless land and subject to uncontrolled mutation. This is also where the unfortunate human mutants from civilised Labrador communities are exiled. Examples include Gordon (the spider-man), and Sophie. The monstrous inhabitants of the Fringes are semi-mythical among Labrador people, subjects of folk tales and cautionary children's stories. Outside of the Fringes. These lands are still dangerously radioactive, and it is believed that anyone who sets foot there will die. Sailors who navigate along the Badlands coast south of Newf report seeing a jungle of fantastic mutations. David's uncle Axel describes tree-sized grasses, succulents like houses with 10-foot spines, cable-like climbing plants which grow directly into the sea, unnameable beasts and birds. Conventional Labrador teaching is that most of the world consists of Badlands, although explorers have discovered other populated regions further south. The sites of past nuclear detonations, at the center of the Badlands: a series of blasted, barren regions where the ground is fused into black glass, where nothing can grow, and even the waters offshore are sterile. Any close approach by ship leads to sickness and usually death; observers who survived told of city ruins which glow faintly in the dark. New Zealand, which was isolated enough to largely escape the holocaust. Advanced industrial civilisation has arisen here again, and telepathy has become universal among the populace. Zealanders were unaware of the distant Labrador civilisation, until one of their strongest telepaths picked up Petra Strorm's prodidgious thought transmissions. (The letter Z has been forgotten in Labrador, causing David and Rosalind to mispronounce the name Zealand). In the first chapter, young David Strorm is introduced. In the first paragraph he describes a recurring dream that he remembers vividly. This dream is of a magnificent city bordered by ocean, although he has never seen the sea in waking life. Once, he recalls admitting this dream to his eldest sister and inquires about the existence of any such place, to which she replies that, although this city does not exist, it may have existed long ago, before God sent Tribulation. She also warns him to suppress such thoughts, for the other people in society did not have such images in their heads either awake or asleep. Fortunately, David has the sense to take this advice seriously. Being a considerably adventurous and independent child, he ventures forth upon a high bank he often visits, which has sand slopes he much enjoys sliding down. While indulging in this pastime of his, a little girl who we come to know as Sophie inquires if what David is doing is any fun. Upon invitation, she agrees to join him in his game. Following a few entertaining slides down the dune, Sophie suddenly catches her foot in a small crevice. While her snagged foot causes her intense pain she adamantly refuses David’s suggestion to remove the shoe to facilitate the extraction of her foot. After much convincing she obliges but makes David promise not to tell anyone of what he sees. To David’s surprise, he notices that Sophie’s foot has an extra toe, but makes nothing of the fact. David helps the injured girl back to her home, where he is uneasily questioned by Sophie’s tense mother. She pleads him not to reveal Sophie’s deformity at any cost, for if people were to discover it they would be very mean to her. David agrees solemnly, sensing the severity behind Mrs. Wender's pleas. Being confused by the seriousness of his afternoon, David wanders home in intense thought. It suddenly dawns on him the reason for which Sophie’s mother made him swear to secrecy, as the Definition of Man recites itself in his mind, "And each leg shall be jointed twice and shall have one foot and each foot 5 toes. And any creature that shall seem to be human, but is not formed thus, is not human. It is a blasphemy against the true image of God, and hateful in the sight of God." The full weight of the secret now rest heavily on David. After meeting Sophie, David returns to his home in the fiercely religious society of Waknuk. The reader acquires a sense of the background from which David’s genealogy stems. His home is one of the eldest in the village and is decorated with multiple proverbs and quotes from ancient religious volumes such as the “Repentances” and the Bible, which are carved and burned into wood. We learn that David’s father, Joseph Strorm, is a prominent and devout community leader amongst the villagers. We learn of David’s grandfather Elias Strorm, an evangelistic pioneer from the East, who was one of the first to establish himself in the Waknuk district, along with his submissive younger wife. Joseph’s demeanor is easily explained by his father’s harsh religious views. It is also established that it is the individual responsibility of each individual citizen of Waknuk to be wary of Offenses and Blasphemies - and this often times means purging mutated livestock and crops that carry the title of an Offence. It is also mentioned that David’s father is the farmer whom has been know to purge the most Deviations in the town. It is debatable as to whether or not Joseph’s father is burdened by a surplus of Deviations in his surroundings, or whether he is one of the select few who do not have double standards. The deviations coming more into play, it is mentioned that Blasphemies are somewhat of horrific folklore and used to the advantage of the pure people as a means of disciplining young children. This may stem from the fact that on occasion, the deformed outcast Blasphemies have been know to venture into Waknuk to raid the village of crops and livestock for their survival in their unforgiving land of the Fringes. In the beginning of chapter 3, we see that David has established a regular routine out of visiting Sophie. Once Sophie’s foot is completely healed, he brings her to one of the interesting sights in the county of Waknuk; the steam engine. Sophie is amazed and this brings forth mild debate about the technological advancements the Old People owned. Once David brings Sophie back home, David sees Mr. Wender, Sophie’s father. We learn that there is visible tension between John and David, David believes that these feeling steam from the fact that Mr. Wender does not trust him: this is understandable, since he is the son of Joseph Strorm whose reputation precedes him in the purging of Deviations. However, David understands the severity of the situation Sophie is going through. This leads to a recollection David lived through recently. While splitting wood one day, David got a splinter. Having tried to retrieve the lodged piece of wood from his hand, it began to bleed. He then went to the house to bandage the wound and everyone was too busy to assist him. Cursing under his breath, he mused at how convenient it would be to have a third arm. After this statement, there was a long pause and David’s father was visibly mortified. He harshly punished his son for wishing to be a Blasphemy. Despite his meek responses, all people present were ordered to appeal to God for forgiveness. He was then sent to his room for the remainder of the evening, where Joseph gave him a beating. That night, sleep came uneasily to David. He had a horrid dream about one of the ceremonies in which his father purges the farm Offences. However there is one distinct difference: instead of a deformed goat or an imperfect stalk of corn, Joseph Strorm is killing young Sophie. David suddenly awoke and remembers feeling terrible. He knows that if Mr. Wender had seen his horror and understood his deep fear of her secret being revealed, Mr. Wender would be much more trusting. On one occasion, when David is not visiting Sophie, he sits in the yard talking with his half-cousin Rosalind; this conversation however is not an ordinary one. David is speaking to her with his mind (telepathically) while she is at home on her own family farm. Uncle Axel, the farm handyman, comes across young David speaking to what seems as nobody. This strikes him as odd and he decides to question the boy. David explains that he is able to speak to certain people through his mind, people far away, well out of shouting distance. Uncle Axel, being one of David’s closest and most understanding relatives, advises him to keep this gift to himself - and not to speak aloud whilst sharing thoughts remotely. David realizes now that this ability is abnormal, comparable to Sophie's extra toes; knowing full well the repercussions of a Blasphemy, he willingly abides to secrecy. Having made this connection, David hurriedly contacts all the people he is able to exchange thoughts with and explains the risk of them being discovered. They all agree to secrecy also. Incidentally, this is the first decision they make unanimously and a sort of group dynamic is established. We learn that the telepaths are all children, scattered around Waknuk and the neighbouring communities: David and Rosalind, Michael, Rachel and Anne, Sally and Katherine, and Mark. There was another who was cut off recently; Axel identifies him as a boy killed in a logging accident. Some others have a trace of telepathic ability, but too weak to be meaningful. Soon after, David hears of an impending invasion from the Fringes, expected to be much more severe that the minor raids normally inflicted by Fringe dwellers. The people of Waknuk devise a plan to counter the attackers. During the siege, the villagers succeed in capturing two of the enemy leaders, who are held captive on Joseph’s farm. David is disappointed at the normalcy of the prisoners. However, he is shocked to notice that one of the men captured looks almost identical to his father with a slightly more unkempt appearance - and the long, gangling, spider-like limbs which are his particular deviation. This spider-man soon escapes and disappears. After the attack, we meet the infamous Uncle Angus Morton, Rosalind's father, who is a considerably controversial character in the community of Waknuk. It appears that the man has very elastic principles and loves to antagonize Joseph Strorm. On this particular occasion, he brags of acquiring two great horses measuring 26 hands high. This statement ignites Joseph's suspicions that the creature are Offences. He confront the town inspector to verify the correctness of these horses. The inspector insists that the horses purchased by Uncle Angus are legitimate and government approved, the result of selective breeding and not mutation. In reaction to Joseph’s protests he refers to an embarressing incident involving the Dakers' family cat, which had never possessed a tail. Joseph Strorm was convinced that the creature was a Deviation and therefore killed the cat, before being notified that it belonged to a legitimate breed. David continues his friendship with Sophie and since she cannot attend school, David takes it upon himself to educate her in matters of Geography, Math and Ethics, which are the principal topics covered in his own schooling. The following spring proves to be relatively “Deviance-free”. The village of Waknuk breaks the local “Purity record”. David often sneaks away to be with Sophie (David’s parents know nothing about her). They much enjoy fishing for shrimps in a secluded stream. David pursues a catch barefoot and eventually coaxes Sophie to do the same, despite her deformity. On one particular occasion, the pair are surprised by the son of the local blacksmith, Allan. David is made uneasy by his presence. Allan inquires as to who the young girl is (for Sophie has had minimal contact with other children) - and then notices something peculiar. On a rock, there is a wet footprint with the imprint of an extra toe. He then deduces that this footprint is Sophie’s and prepares to make the Blasphemy public. In an attempt to stop the boy, David attacks him. After a brief scuffle, Allan suddenly falls limp; Sophie knocked the boy out with a blow to the head. David immediately takes Sophie home; they explain what has happened, and Sophie’s parents see fit to leave town because their daughter is at risk. David asks to go with them but they reluctantly refuse, because his disappearance would raise the profile of their own departure enormously, and have them closely followed. After they are gone, David decides to sleep at the empty Wender residence. The next morning he hurries home, hoping to return to his room early enough to pretend that he was there the entire night. This, however, is not the case. David’s father is livid about his son’ absence, and is in the company of the local inspector. They question David about Sophie and David pleads ignorance. This furthers Joseph’s temper and David is once again detained in his room for a severe beating. Afterwards, David lies in his bed and sobs because of the secret he had told. After having suffered a harsh beating from his father for sleeping at the Wender’s deserted house, he is left alone in his bedroom and he talks to his friends who share his telepathic ability he tells them about Sophie and her secret. As he attempts to find sleep, he dreams again of the once familiar Big City. In desperation, David decides to escape from Waknuk. When he awakens the following morning, He is questioned by the Inspector and David is still very evasive David’s doubts in his culture grow steadily especially with the lecturing of the Inspector about the Devil tempting us from purity during this discourse, they are interrupted by David’s father who announces that the Wender’s have been captured. David is grief stricken and guilt ridden until the Inspector reassures him that the capturing of the Wender’s was purely by chance of routine patrollers and that it was not what they had spoken about that had given them away. A few days later, David confides in his Uncle Axel and tells him of his plans to run away, Uncle Axel strongly advises against doing so. Despite David’s persistence, Uncle Axel continues to tell him of the world beyond the county of Waknuk. He explains what lies south Rigo, things that have never been taught to David in school. He then explains that the terrain outside of their familiar territory is plagued with dangerous deviations and that there are unspeakable monstrosities in areas known only as the Black Coasts. The explorer, Marther, gave this name to the lands beyond in his writings during various expeditions particularly one on the Venture, the only known ship to have returned from the land beyond the black coasts with tangible artifacts. He goes on to elaborate on the intense deviations and their nature. Uncle Axel Also attempts to comfort David about his gift and explains that there are many different races outside of Waknuk and therefore many different definitions of what the norm is and how each of these different races believe they are of the true image of God. He also points out inaccuracies in the book,Repentances and tries to break David of the mold of thought he is forced into from school and his father’s harsh teachings. The existence of other possible true forms suggests that David and the others who share his gift could just as well be closer to the true image of god as anyone else. He inquires to know exactly how many people David can actually speak to and David explains that there were formerly 8 he has been unable to reach the eighth member for some time now he worries that something bad may have happened to him and that it may come across all the others who share their gift. Uncle Axel promises to discover the reason behind the absence of their 8th counterpart. David is convinced to stay in Waknuk for the time being. David’s mother having been pregnant for the past 9 months finally gives birth to a child. The child must obtain its certificate of normalcy before it can be addressed as alive and existing. Until the inspector does so the fact that there is new life in the household remains unacknowledged. Unfortunately, the Inspector is late and his tardiness angers Joseph Strorm. Upon his arrival, he is leisurely and unrushed which is almost as frustrating to Joseph. The new child is found to be perfectly normal and is certified. Her existence is confirmed and Petra Strorm is greeted into the world. A few days following Petra’s birth, David’s aunt whom he is very fond of, comes for a visit with her own newborn child. The sisters are thrilled at their new children until Harriet Somberly states that she has yet to certify her daughter because she knows her daughter will not meet the normalcy standards. Desperately she attempts to convince sister to allow her to borrow the infant Petra to have her certified instead of her own daughter. While pleading she says that her husband would leave her if she were to produce another Deviation and that her sister is the only chance she has to save the child she loves. Harriet’s sister is disgusted and adamant upon her refusal. She is outraged that her sister brought such filth into her home and orders her sister to leave immediately. Joseph arrives and is equally appalled by what Harriet has done. He chastises her for having sinned and for even having thought of such a devilish way to save a Blasphemy. Harriet leaves and the next day she is found dead in a river with no baby to speak of. After having heard of Harriet’s death, she is mentioned in the evening prayer but never again. She is literally wiped from knowledge. It is implied that her death was a suicide. Scared by the recent turn of events, David develops an intense desire to become normal and never be in a position like his aunt. He begins to pray constantly to lose his ability. On one particular morning, his Uncle Axel calls him out to help him fix a plough. David confides his fears associated with the death of Harriet, however, his uncle reassures him and helps him find reason and acceptance of his ability. They move on to the case at hand and Uncle Axel reveals that the boy whom David and the others have lost contact with was unfortunately killed while cutting timber and was the victim of a crashing tree. David shares this discovery with the other people whom he can communicate with. We become aware of them each specifically. We learn that Michael goes to school in a different area and learns things that the rest of the children do not. He is able to pass on the others what he is being taught and they in turn help him with his lessons. A sense of functional unity is found for the next six years until a 9th person is suddenly revealed. Six years after the death of Harriet, David is one day working out in the fields and he suddenly feels an unstoppable need to run, urgent and unlike anything he has ever felt before. The mental cries are painful and persistent and continue until he reaches a river where his youngest sister Petra is about to drown. He successfully saves her and Rosalind also arrives. She also felt the cries and states that the calling was stronger than anything any of them are capable of. Upon their return they are questioned by surrounding people asking how they could have possibly known what had happened to Petra. They claim that her cries of distress were perfectly audible to anyone and that they are surprised no one had heard them. That night, David has terrible dreams of a purging ceremony where the deviation to be killed this time is not a crop or animal or even Sophie but David sees his sister Petra at the hands of her father. The next morning David desperately tries to contact his sister through thought shapes but is unable to. He attributes this to her being so young and unaware of her ability and convinced that the only reason that she was able to make such a cry of distress was because she was in a position of such intense danger. David considers openly telling her but decides against it because it would only make him more vulnerable to discovery and that he could tell her when she is older. This recent development is still very unsettling. David has felt a sense of impending misfortune for some time now. He refers to last year when there was an uncommonly high deviation level his father alone had lost 3 fields as had Angus Morton a persistent rival of Joseph’s. It is said that there were a total of 35 field burnings due to Deviations. David recalls getting an earful from Old Jacob a villager who has seen his share of years. Old Jacob attributes this recent hike in imperfections to corruption in government and carelessness of the youth. He believes that the changes are the early beginnings of a new age Tribulation. This heightens David’s self-awareness and intensifies the need to be secretive the logic being that with things going wrong, people will have a keep eye for scapegoats for imperfection. This anxiety is slowly abated over time until they discover that Anne, one of the people who can send thought shapes like David, plans to marry. The man Anne is to wed is not only a person of the norm but the son of the local blacksmith - the same Allan who discovered Sophie Wender’s secret during childhood. At first the group take the proposed marriage seriously because of the social difference between the two families. However, the engagement is formally recognized. Despite vivid warnings against this union, Anne is determined and goes so far as blocking the others out. The remaining people of the group are understandably uneasy being aware of the vulnerability and submissiveness a bride can incarnate and the reputation of Allan based of previous acts. David shares this dilemma with Uncle Axel and he strongly agrees with where David stands. He even suggests that it way even be worth killing Anne to protect their secret. David however refuses this option. Once Anne is officially wed, she severs any ties with everyone else who share the gift of thought-shapes. During this, feelings between Rosalind and David blossom and they discover true love. However, since Rosalind is the daughter of Angus Morton, there is some familial rivalry, which complicates their love causing them to remain secretive of their bond. A mere 6 months after Anne’s marriage to Allan, he is found dead in a forest with an arrow through his neck. David and the group simultaneously attempt to reach out to Anne who is convinced that they had something to do with Allan’s death. The next day, Rachel part of the group and also Anne's sister, tries to confront her, but Anne does not answer her door. Alarmed, Rachel reaches the neighbor and they break into the house to find that Anne has hanged herself. By her corpse, there is a letter addressed to the inspector the neighbor finds but since she is unable to read, she assumes it is addressed to the deceased girl's family. Rachel opens the letter and finds that it denounces all of the people who are able to send thought shapes. The letter is destroyed. However tragic the means to an end; the tension breaks. The murder of Allan still remains unsolved. Gossip plagues Waknuk but no one is unanimously suspected. The spring following the death of Allan is relatively Deviance free there is a grand total of only 2 fields burned none of which belong to either Angus Morton or Joseph Strorm. David’s little sister Petra grows up and develops an adventurous side on one particular occasion, she ventures off into the forest on horseback she is forbidden to visit. Once again, David is suddenly summoned by a violently powerful thought shape and follows it to the source the call also drives Michael and Rosalind to do the same and they are confronted by the sight of a terrible Deviation feasting away at Petra’s pony. The Deviation is killed and Petra is rescued. All others in the group also meet in the forest having been signaled by the cry. This is the first time they all meet in person. Suddenly a Jerome Skinner who followed them in to the forest surprises them all. They manage to evade his suspicions. As a group they each a consensus that Petra’s calls, if there are more, are to be handled strictly. David and Rosalind agree to take responsibility for responding, but if the calls become overwhelmingly intense, anyone who can reach Petra is to do so and make her lose consciousness immediately. After the incident, David makes another attempt to teach his sister thought shapes and help her control her power. She reveals that she is able to hear people further away that David cannot. David returns to Uncle Axel who asks David if he's been careless and speculates that people are suspecting things. He mentions Joe Darley. He concedes to having killed Allan because he knew that Anne had told him everything and that at the time he was killed he was on his way to tell the Inspector. When asked about Jerome Skinner, Uncle Axel says he will find out who he is. When David confers with the others, Michael suggests that they should all be on their guard and be ready to leave on short notice if things go wrong. One night, David awakens suddenly to the signal of others telling him that some of the Chrysalids have been captured. In a panic he immediately reaches Petra and they meet with Rosalind. With nothing but a horse, they make their escape from the land of Waknuk into uncharted and dangerous territory. Soon after, David is alerted by Michael who tells them that they are being followed and should maintain constant vigilance. This warning is proven true when Rosalind kills a man threatening their surreptitiousness. The importance of secrecy is solidified by this and therefore, David and Rosalind decide to travel solely at night. On the following day, they are reached by the desperate cries of one of the captured Chrysalids; Katherine. We learn that she is being withheld against her will by the inspector. She is being tortured for information, unfortunately with success. Fortunately however, from what Katharine was forced to divulge, the inspector is only aware of the existence of David, Petra and Rosalind (and obviously Katherine). Determined, the inspector states a reward for the capture of the escaped Deviations; he is entirely committed to learning about the ability of the Chrysalids and guarantee that such a blasphemy never occurs again. David and his companions decide to venture into the land of the Fringes to lose the stalking puritans and on Michaels behalf, he says he will see as to how he can fake the deaths of the escapees in a effort to put an end to the manhunt. When Michael communicates with Petra she asks him why the messages he sends are mixed with those of another mystery person. This mystery person is found to be a girl who Petra feels she can identify with. She tells this person their coordinates and they exchange information. When Petra confers with David he realizes that the descriptions Petra’s new friends environment seems to match David’s dreams from long ago. David, Petra and Rosalind feel an elevated intensity motivating their quest. On their journey, a man on their path confronts the group. Stranded, they resort to knocking him off his horse and ride on in a hurry. Petra continues to converse with the girls from David’s dream city. She explains to them that she is sending help to rescue them and bring them to a safe place but until then, Petra must be protected at all costs. Soon after, Michael tells the group that the pursuit is back in full force. Ironically, they are shot at while traveling and they chose to take cover in the woods. When they think all is safe, they reach a clearing and suddenly from above something unknown and solid falls upon David and makes him loose consciousness instantly. When David regains consciousness, he notices that they have been captured by the Fringe folk and they are being taken prisoner. Despite this they notice that they are now in range with the girl from David’s dreamland (Sealand) so that now he and Rosalind can now communicate with her instead of just Petra due to her stronger power. When the Fringe people reach their destination David comes face to face with the spider-like man he once met during a raid in his hometown many years ago, the man who bore a striking resemblance to Joseph Strorm. We learn that this man is indeed David’s uncle. We learn that David’s uncle’s abnormality was not discovered until four years after his birth. Thankfully, his mother saved him from his tragic fate but however Gordon still vows revenge on the ways of the people of Waknuk, more particularly his idealist ignorant brother. In an act of brutality, the people of the Fringes decide to keep the two girls traveling with David for breeding purposes. Gordon encourages David not to protest and he is driven outside the Fringe village where he is beaten unconscious again. Once David resurfaces, he notices he is being dragged but none other that his old time friend from Waknuk; Sophie Wender. Due to her deformity she lives with the rest of the Fringe people and we learn that she loves the Spider-Man but was rendered infertile upon her banishment from Waknuk to assure that she would not reproduce her deviation once released into the Fringes. Therefore she is jealous of the potential the new prisoners have that she doesn’t. Motivated by her own devices she chooses to help David back into the Fringes town to rescue his friends so that they may continue on with their quest. David contacts Michael and he notifies him that the team following he Petra and Rosalind are making slow progress because of the antagonizing attacks from the Fringe people. Sophie is to creep into Gordon’s tent where the girls are being held and she is to rescue them unnoticed. She therefore urges him to tell the girls to make absolutely no noise or sign of alarm once she arrives. Sophie’s plan proves successful and Petra David and Rosalind are reunited Sophie is seen cleaning blood from her hands and feet upon her exit from Gordon’s tent. Once escaped, Sophie explains to David that they are safe with her but that they must lay low until the search is off because the Fringe people will surely seek them out once they notice that their two “breeders” are missing. Rosalind is uneasy about trusting Sophie. Jealousy and animosity are very present for Sophie is bitter about the way Gordon values Rosalind for the things Sophie lacks. She therefore wishes she could offer the gift of children to the man she loves. Michael is with the group of approaching Waknukians. Michael hopes that they can count on the help that the girl from Sealand is promising. She tells them that she is roughly 8 ½ hours away. Sophie momentarily leaves the group and upon her return, she mentions that the Fringe people pursuing them are leaving the fight from the Waknuk people to resume their original pursuit yet the Waknuk attack is still in full force. David considers the repercussions if he were to confront his father in battle. Sensing his anxiety, the girl from Sealand urges him to let go of his father because the way of life his people follow is dying and virtually obsolete. Sophie once again leaves for reconnaissance and returns roughly one hour later saying that the Waknuk group is approaching. David communicates with Michael and tells him to stay back from the forefront of the attack to avoid getting hurt so that they can reunite. The strange girl once again contacts the group to let them know that she will be able to arrive a hour earlier than originally planned. Sophie heads back out to see the progress. As she does so, the Fringe people and the Waknuk party clash. In the heat of the battle Gordon shoots Joseph Strorm in the chest with an arrow killing him. The Spiderman picks up Sophie who was by his side and they make a run for it. Soon he is pummeled by a downpour of arrows and dies. Sophie attempts to run away and is shot in the arm and neck and dies. During the culminating point in the attack, suddenly a craft appears in the sky. Looming over the combat, the violence ceases and some of the fighters flee, others watch. David calls Michael forth to rescue him for this is the craft from Sealand. The raft expels a form of cobweb-like substance upon the crowd below and paralyses them all rendering them invulnerable. This substance unfortunately also reaches David’s hands and it has the same effect on him. He becomes entirely paralyzed. Consumed by the web-like substance, David is immobile. He feels Michael (who is also enveloped by the web) worry that perhaps he should have simply run away from the descending craft in fear that it was a trap. He is reassured the Seawoman’s soothing thoughts. The door of the fish shaped craft opens and out comes a figure. She frees Michael. The person is unrecognizable and is dressed in white garments from head to toe. The figure comes into the cave and removes the cobwebs from David, Petra and Rosalind who were also affected by the substance. The woman from Sealand is positively delighted to see Petra and gushes over her potential and explains how they will train her and endorse her gift with all the teachings they can offer. They prepare to leave when Michael asks about saving Rachel from Waknuk, this however is not a possibility seeing as how the craft runs on fuel and only has a scarce remaining supply; just enough to return them to Sealand safely. Rosalind inquires about the other web-ridden people in the field below them and the Seawoman explains that the substance killed them. She explains that is an unfortunate yet necessary price to pay for the survival of their species. Michael gets Petra to reach Rachel for him and he tells her to tell Rachel that they are all safe and that he promises to retrieve her from Waknuk and that they will go to Sealand together. David, Petra and Rosalind embark upon the vessel and watch Michael as they leave. In the midst, they see Sealand horizon and David recognizes it exactly as the land in his dream. They hear thoughts buzzing and realize it’s the entire society conversing beneath them. This page was last modified on 17 January 2018, at 21:21. This page has been accessed 14,999 times.